Before getting to excited with the prospect of ERTL in the UK, hold it back for the time being because at this stage, we only have access to a few ERTL models. And why might that be we hear you ask? Because ERTL deal with the US market, just as Britains deal with the UK side of things. America is the biggest market so get all the best toys, well we're only likely to see these great big farm toys when someone makes an effort to sell them here. Are ERL Big Farm in the UK? Well, yes and no; if you mean remnants from the past then a few toys remain, but for the recent ERTL Big Farm range than its a resounding no. 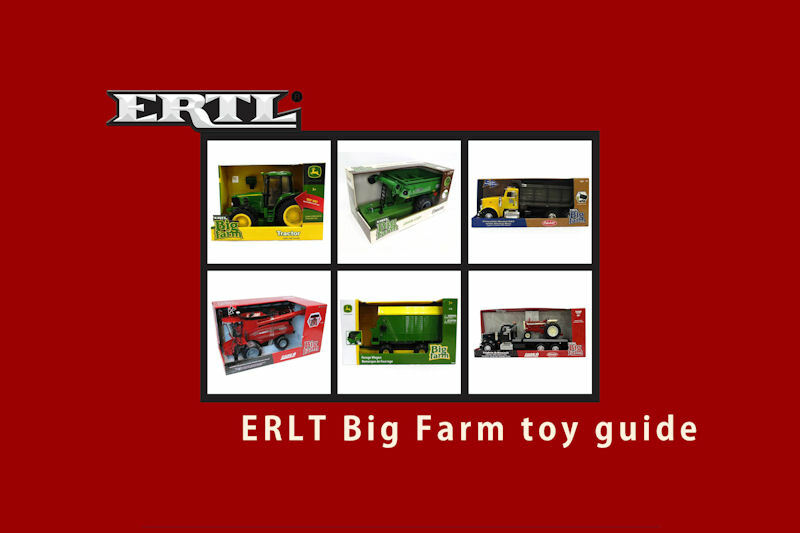 This is because here in the UK Big Farm comes under the Britains Big Farm label, well in the USA the Big Farm toy brand is labeled like this: ERTL Big Farm. So basically it's the same thing but a relabel, to satisfy the European and North American markets respectively. In the USA, ERTL primary range is 1/64 scale farm toys, well the 1/16 'Big Farm' range is there to compete with Bruder in the big tractor toy sector. For now, we only have what people import from the States to the UK. Who came first, Britains Big Farm in the UK, or ERTL Big Farm in the USA. Regardless, its the American's who enjoy the biggest and best farm toys from this series, than we will ever likely to see in Britain. Here we're really restricted to maybe a tractor and just a handful of Big Farm trailers. Well in the USA the tractor and trailer range is far greater. What is more infuriating, the USA also gets Big Farm combine harvesters, balers, trucks and pick ups to add insult to injury. TOMY is an American company so will naturally look at the biggest market first, so well we don't have anything like this at this time, its sure to happen down the line. If you do get hold of a ERTL Big Farm toy of any kind, rest assured it will be compatible with our Britains Big Farm range, and vise versa. Between both ranges, its only the names that separate the two. In which case, if you have a Britains Big Farm tractor, you could end up with a ERTL branded trailer (and you might), but the trailer will connect to the rear hitch. The rest of the range will fit in thanks to the 1:16th scale, and well they don't need to connect in any sense, they will work hand in hand. To put it into perspective, we estimate ERTL have 50 or so products, compared to Britains measly 20 or so Big Farm toys. To get a sense how the ERTL Big Farm range compares to our Britains Big Farm, we have created two tables, each listing their own product range. Just so you get a clear picture who makes what. If you must research the ERTL Big Farm toys yourself, search life this: ERTL - Item Code - Product Name - and this should provide a more accurate result. As it stands, we really only have a few ERTL toys here that we can use with Britains Big Farm range, will this collection get any bigger, well we're pretty sure it will. On the other hand, if you're willing to spend big dollars, you can buy a Big Farm toys, online from across the pond, where the full range can be bought. Its costly with shipping and you may end up paying double with import duties, so be prepared. In the meantime, be patient and get in contact with Britains on social media, give them a hard time why we don't the toys the US does.